From Digi: "AWS re:Invent 2018 Rewind: Emergency Medical Rapid Responses Systems Demo with Digi and AWS IoT"
As an AWS Advanced Technology Partner, our team was thrilled to be exhibiting last week at AWS re:Invent, Amazon’s annual conference bringing together the Internet of Things (IoT) and the global cloud computing community. 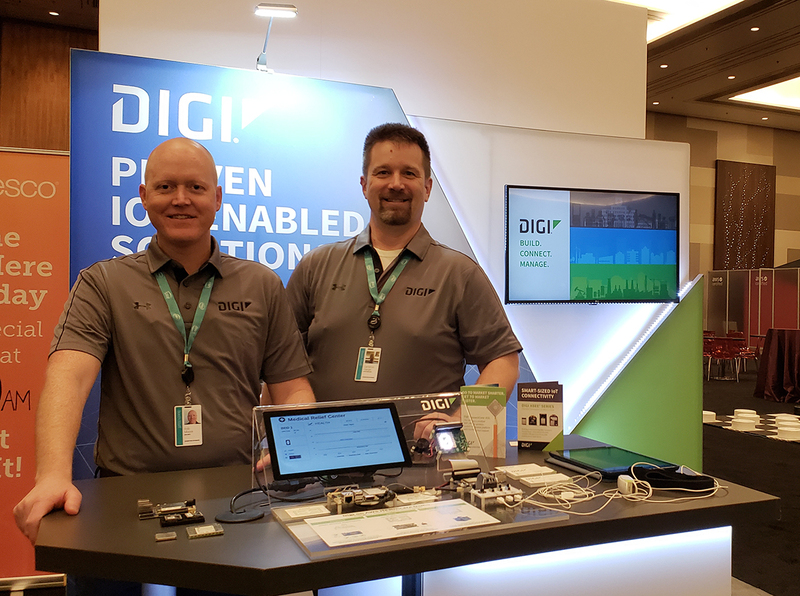 In the Quad at the ARIA, also known the Experimental Center, we showcased solution-based and hardware enabled technology such as the Digi ConnectCore® 6UL SBC PRO and Digi XBee3® Cellular, sharing customer impact stories, and demonstrating how to connect to AWS IoT. 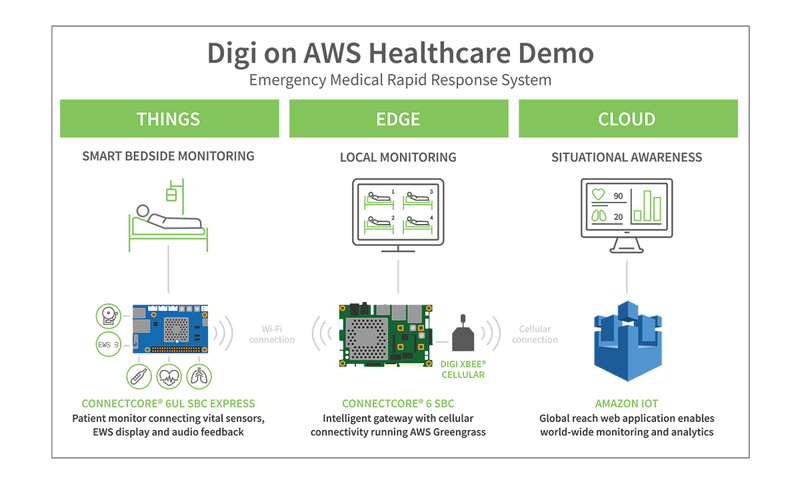 At the event, we interviewed our Digi experts about the Digi on AWS Healthcare Demonstration to better understand how IoT and cloud connectivity work together to implement emergency medical rapid response systems (RSS). 1. What exactly does the Digi on AWS Healthcare Demo demonstrate, and how? It demonstrates the concept of implementing a rapid response system (RRS) for large scale emergencies such as a natural disaster and the emergency medical relief/treatment response center. The demo is based on continuous monitoring of patient vital signs that will help medical staff to treat patients more efficiently while enabling quick response to address failure to rescue events. The general concept is also applicable to monitor non-hospitalized patients at home or patients in hospitals waiting to be admitted in urgent care. Each patient has a vital bedside health monitoring device. These devices are continuously monitoring body temperature, heart rate, and respiratory rate. The bedside devices are individually calibrated to take into account the patient’s condition when deployed. The AWS cloud contains the AI capabilities to choose the best data model fit for the patient at hand, taking into account medical history, present condition, medication, ongoing treatment etc. With this data model the device is able to apply several scoring systems to provide a single Early Warning Score (EWS) that can be used by the nurses to prioritize care: EWS 2, escalation to nurse; EWS 3, escalation to RRT; EWS 4, escalation to lead medical on-call staff. 2. What kind of connectivity does this demo use? This demo features an edge gateway + a bedside setup on a Wi-Fi LAN connecting to AWS IoT. Remote access to the AWS cloud is handled by a cellular connection using Digi XBee3 Cellular. In summary, AWS re:Invent 2018 went beyond exploring the Internet of Things connectivity and moved into a better understanding of deployment, for both the IoT technology stack and customers. VP of Product, Scott Nelson, elaborates more on this and the AWS IoT services that help IoT developers cross the chasm from the edge connectivity to cloud in his latest blog “Building the Amazon Bridge: A Review of AWS Re:Invent 2018 #reInvent.” Transient data, rapid innovation, and technology retrofit are three big takeaways from this year’s event.